The Department of Conducting was established in 1949, the same year in which the Tokyo Geijutsu Daigaku was established. In those days, students seeking to study conducting were required to transfer from other departments in their third year. Now, students are enrolled directly into the Department of Conducting upon admission to the university. Students of the department are trained in the skills needed, as professional conductors, to conduct a wide range of music, including symphonic music, operas, ballets, and oratorios. The educational philosophy of the Department of Conducting is to train students not just as highly skilled musicians and artists, but as conductors with exceptional interpersonal and leadership skills, based on lessons in practical techniques and through various classes provided by the department. For this reason, in addition to lessons in practical techniques, students are encouraged to gain a wide range of knowledge and experience required by conductors, including studies of musical works and treatises on theory. A major goal for the students following graduation is to work as a capable professional conductor and to function as a musician capable of making broad contributions to society through strong leadership in art and music. 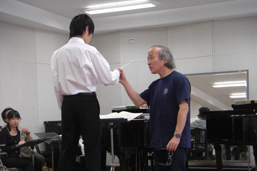 Faculty : The Department of Conducting was established in 1949, the year of the establishment of TOKYO GEIJUTSU DAIGAKU. Initially, the department had a transfer system in which students seeking to study conducting were required to transfer from other departments in their third year. However, in the current system, students are enrolled directly in the department from the first year of undergraduate studies. In the Department of Conducting, a curriculum based on the following policy has been organized to nurture students equipped with the fundamental practical techniques of conducting. 1. The established curriculum fosters the acquisition of the fundamental techniques of conducting such as solfege, harmonics, and score reading along with basic theoretical knowledge in the first year and the second year. 2. From the third year, the curriculum includes a wide range of studies such as more advanced score reading, music history, opera conducting practice, singing, and playing musical instruments. Through all these studies, students acquire comprehensive abilities beyond the department curriculum, and therefore, they are encouraged to study other subjects. Master: In the Master’s Program, the aim is to provide education so that students can acquire skills to enhance their expertise. 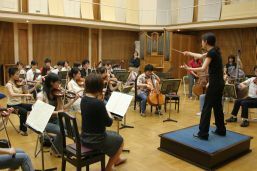 With this aim, the program includes the study of not just orchestra music but also opera, ballet, and oratorio, including advanced and wide range of practical techniques in conducting through additional research in conducting and special study of music books. Furthermore, the students are guided to set the theme and conduct research each year, receiving special guidance in the specified domain and are systematically prepared for the thesis. In the practical techniques of conducting, students are encouraged to actively participate in the university concerts as well as in concerts, workshops, and competitions outside the university. The curriculum is also designed to nurture conductors who can be internationally active. Doctor: In the doctoral program, in addition to research at the Master’s level, the curriculum is designed to enable students to acquire more advanced and specialized research and practice of conducting through special research in conducting and the study of music books. Furthermore, as in the Master’s Program, the curriculum is designed to encourage students to actively participate in concerts, workshops, and competitions within and outside the university and nurture conductors who are capable of being internationally active. In addition, apart from the conducting curriculum of the Department of Conducting, several workshops and master classes are conducted by inviting eminent domestic and international conductors. Doctor: In the doctoral program, the aim is to nurture individuals who can contribute widely to society by having more advanced academic knowledge, performance skills, and leadership skills. The goal is to nurture individuals who have combined a humanistic outlook with professional expertise, possess a broad perspective, and who are capable of performing leadership roles in the world of music while collaborating with society. In addition, the program nurtures individuals to have leadership skills as musicians and artists, and participate proactively in activities in the international community. The doctoral degree is awarded once, in addition to the studies in the Faculty and Master’s Program, a more specialized research program has been conducted, the stipulated credits have been acquired, and the doctoral dissertation and the orchestra conducting has been reviewed by the Thesis Review Committee. Students in the Department of Conducting are required, as a matter of course, to acquire solfege and music dictation skills, but more importantly, they are required to develop a rich and persuasive musical sensibility. To nurture musical maturity, the curriculum covers various aspects of music, including composition, musical instruments, and vocal music. During the first and second years, students master basic theory and technique, including solfege, harmony, and score reading. From the third year, students choose from a wide range of studies, including more advanced score reading, music history, opera-conducting practice, singing, and playing musical instruments. In the fourth year, students are given the opportunity to actually conduct an orchestra and to direct an on-campus concert as well as a graduation concert. During their time in school, students are exposed to a wide range of activities outside the Department of Conducting curriculum. These include master classes and workshops provided by noted conductors both from home and abroad. Following graduation, many students continue their education by studying abroad, participating in international competitions, and so forth. Graduates are currently active with orchestras, opera houses, and other musical institutions, both at home and abroad.